Enough theory, enough lists. I’m back from Rome, (and back to streaming!! ), which means I’m back to playing a whole lot of Magic. Today we’ll be talking about Jeskai Control with Nahiri, the Harbinger, breaking down the decklist, exploring variations, and discussing its strengths and weaknesses in Modern. Let’s get to it! Jeskai Control in Modern has been played to varying degrees of success for a few years now. As far as I can tell, the origins of Jeskai Control began when UR Splinter Twin players branched out in an attempt to incorporate white sideboard spells, Path to Exile, and to a lesser extent Restoration Angel and Celestial Colonnade, into the classic two-color combo-control shell. These lists were still heavy blue-red, but trimmed some of the narrower spells Classic Twin would play like Spell Pierce and Flame Slash. The inclusion of white in the archetype provided significant value, and for a time before the printing of Kolaghan’s Command it was common to see Twin in three flavors; Classic UR, Temur (with Tarmogoyf) and Jeskai (with Restoration Angel and Path to Exile). With access to Kiki-Jiki, Mirror Breaker as yet another combo piece, Jeskai Control had the unique ability to be multi-dimensional in a highly linear format, shifting between control and combo and tempo on a dime. In Valencia, Spain, at Pro Tour Born of the Gods, the format was primarily composed of Melira Pod, Twin variants, and Affinity. Shaun McLaren, the Lone Wolf, came out of the woodwork with this masterpiece, laying the groundwork and setting the stage for Modern’s revival. In a field characterized by aggro (Affinity), grindy midrange (Pod) and tempo control (Twin), Shaun McLaren unleashed a pure control archetype and devastated the opposition. Birthing Pod couldn’t handle Anger of the Gods and Porphyry Nodes. Affinity couldn’t fight Lightning Bolt, Path to Exile and Lightning Helix. Splinter Twin couldn’t go over Sphinx’s Revelation and had trouble fighting through Shaun’s interaction. Besides two Ajani Vengeant and a single sweeper, Shaun could play entirely at instant speed, and (true to form) his entire Plan A was “Land, Go.” With access to 26 lands, 10 counterspells, and only two win conditions, Shaun’s take on UWr in Modern was truly a clinic in pure control. After Pro Tour Born of the Gods the metagame adjusted, and Shaun’s control masterpiece fell to the annals of history, only remembered in dark FNM corners by middle-aged control diehards holding onto the glory days (looking at you, Dad). Jund became playable once more, Burn made playing to turn 20 highly suspect, and overall most decks in the format adjusted to packing some true control hate. UWr (now called Jeskai) dropped to Tier 2, and then quickly disappeared from the top tables entirely. If her -2 was just Lightning Helix, I’d be happier, but we already have that with Ajani Vengeant and he sees barely any play. The fact that she not only doesn’t do anything to protect herself AND doesn’t really do anything to get us ahead without jumping through hoops is not good news. Better cards have seen *no play* in Modern (again, looking at Ajani Vengeant) that I’m not positive about Nahiri’s chances here. Still, the +2 discards stranded Blightsteel Colossus‘ that the -8 can then go fetch, so maybe some Mardu control deck uses this as a value card to find more answers, handle some problematic permanents, and kill the opponent eventually? A deck like that doesn’t really exist, unless you count the Mardu Control deck floating around since the last Pro Tour. A strong metagame shift would have to happen to make Mardu playable, and THEN we would need a reason to play this over Ajani Vengeant. Pass. Nahiri, the Harbinger, while still a slightly clunky, expensive four-drop, nevertheless solves multiple problems for the control archetypes that are currently employing her. Reactive strategies in Modern face the awkward issue of employing high-impact, relatively narrow answers to powerful threats. Think Stony Silence against artifacts, Izzet Staticaster against X/1’s, and so on. A certain love-hate relationship exists with these spells, as their value can vary wildly from life-saving to life-taking based on various in-game conditions. Stony Silence does nothing against a triple Signal Pest draw, Izzet Staticaster is worthless against a unchecked Steel Overseer, etc. In this context, Nahiri’s loot ability simultaneously helps her owner dig to specific answers while discarding under-performing spells and extra lands. Her +2 rewards the current high-impact, narrow-application style of Modern sideboarding, as well as working to overcome the inherent disadvantage control decks suffer with their comparatively high land count. Her -2 is functional, and her ultimate wins games, but above all else is actually reachable. 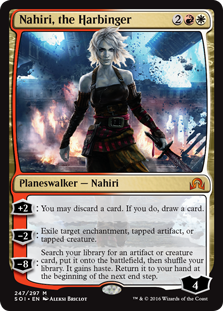 Unlike Liliana of the Veil (the other planeswalker that sees play in Modern), Nahiri, the Harbinger starts at 6 loyalty more often than not, and is threatening ultimate two turns later. In a format that contains no Hero’s Downfall type effect, opponents are forced to answer the Abrupt Decay-immune in-play Nahiri with either attacking creatures or damage-based removal. Her starting 6 loyalty requires two Lightning Bolts immediately to remove, and attacking with creatures against an archetype with eight one-drop removal spells and Snapcaster Mage is suspect at best. While her two active main abilities are functional, her best “ability” is the fact that her +2 is a +2, and not a +1. When paired with a high starting loyalty, Nahiri can even sit on board looting against a 4/5 Tarmogoyf for multiple turns with no protection. I’m including this second self-quote not to “make up” for my first blunder, but rather because I think I said it the best I could after Ingram’s win. Nahiri’s ability to sit at 6 loyalty immediately is a game-changer for Modern and is already starting to make waves in the metagame, like an increase in Dreadbore and Maelstrom Pulse. This is my current list, based very heavily on Peter Ingram’s update from SCG Dallas. Initiate Primer Mode now. At the center of this strategy lies Nahiri. Seductive, dangerous, vicious Nahiri. Nahiri, the Harbinger does hundreds of things for this archetype, but predominantly among them she allows us to cut down to one dedicated win-condition spell while simultaneously helping us turn the corner. Her deceptive power comes in her unique ability to increase the consistency and strength of our draws with her +2, buy us time and protect herself with her -2, while also winning the game on the spot if we can just protect her for two turns. Nahiri protects us from flood, digs us out of screw, finds sideboard spells and narrow answers, makes good draws better, generates value on her own and even gains us life (when creatures attack her instead of us). We are playing four and would play more if we could. Only Liliana of the Veil out of Jund is better, and that is just because she costs three and is mono-color and thus easier to play. Seven to eight one-mana cantrip spells is about the norm for control decks right now, and Ancestral Vision has taken the title of “second best” from Thought Scour in most archetypes. My Grixis Control list with Tasigur, the Golden Fang and Gurmag Angler circa 2015 plays Thought Scour instead, and Delver lists will often opt for Thought Scour for the immediate impact, but almost every other blue archetype is choosing Ancestral Vision instead. Currently, some viewers of my stream still think Ancestral Vision isn’t “good enough”, but they also think Jace, Vryn’s Prodigy is bad so it’s hard to tell. What I do know is that Ancestral Vision is currently spiking on MTGO and selling for around 55 tickets, and that you should play it. The first two need no explanation, but Lightning Helix I’ve found to be an interesting spell. 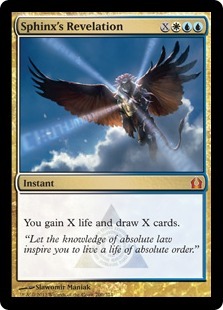 From the outside, as a Grixis Control player I often find myself begging for a way to gain a bit more life, but as a Jeskai Control player I find myself trimming Lightning Helix often in post-board games. I’ve found that it’s excellent as a Game 1 card in the most aggressive matchups, but everywhere else it’s just an expensive Lightning Bolt, or worse, a semi-dead card. You can’t fling a Helix on turn one or two and then flash it back with a turn three Snapcaster Mage like you can a Lightning Bolt, and it often gets replaced by better options for the matchup when I go to sideboard. Now, just because we find ourselves cutting the same card in multiple matchups in post-board games doesn’t mean it is poor. Oftentimes Game 1’s come down to our life total being the deciding factor, and three to six extra life can be the difference. In post-board games it’s often other factors that determine victory (did they find Thrun, the Last Troll, did they kill our Nahiri, etc.) and the extra life doesn’t matter as much. I started with one, went to three, am back to two and liking how that feels right now. A month ago, Remand was excellent and I played four a few times. Now I’m playing two, mainly because I enjoy playing with the card and don’t like losing blue matchups ever. The number of archetypes just mising Ancestral Vision has gone down considerably, replaced with Infect, Affinity, Suicide Zoo and the like. In those matchups, Lightning Helix is better, and I’ve found that their values are often inversely related depending on the matchup. If we’re playing three Remand/one Helix or vice versa, that should give us a hint as to the current state of the metagame and how we’re hedging our maindeck to fight the metagame. Another solid Game 1 card similar to Lightning Helix, Timely Reinforcements can get us out of some tight spots and buy time against Tarmogoyf and the like, as well as just clogging the board to let Nahiri +2 twice to victory. It’s an A+ in the matchups where we want it and the card I’m most excited to play white for, besides Stony Silence and Path to Exile. Fast enough to matter against Affinity, Infect, and Suicide Zoo, Anger of the Gods also does great work against Abzan Company and can help us out against Lingering Souls in a pinch. I’ve ran into Dredge decks often enough online to want this card there as well. But that matchup is poor enough that multiple copies (or Rest in Peace) are needed to have a chance. Currently I’m not playing Rest In Peace as I’m stubborn, but that would be the first card I would add to the board. As the format adjusts more to Nahiri, the Harbinger and aggressive decks move “lower” to fight the inherent inefficiencies present in spells like Dreadbore and Maelstrom Pulse, Anger of the Gods will only get better. Pay attention and be ready to load up on these when the time is inevitably right! My time with Grixis Control has seen me grow familiar with a singleton Damnation in the maindeck, and Supreme Verdict fulfills a similar role here. While we have a lot more removal than Grixis Control has access to, I still like a sweeper to clean up tokens or a flooded board. Sweepers and planeswalkers are a recipe for success as well, and Nahiri can often force an opponent to play full to the board to take it down. In addition, Grixis Delver’s increasing popularity makes access to a “can’t be countered” clause extremely valuable. While Jeskai Control has an easier time with that matchup than Grixis Control, normal matchup gameflow has the Delver player landing a second threat with counterspell backing in the midgame, and a Supreme Verdict can often be game-swinging at that point. This is to say nothing of other matchups, where we’re often looking for a big effect to pull us back into the game against Jund, or needing to nab an Etched Champion against Affinity. I’ve been seeing an increase in Thrun, the Last Troll and Kitchen Finks to combat Jeskai’s redundant-removal gameplan, so keep in mind that every sweeper brings with it a disadvantage. If we can fit it, a singleton Electrolyze is good in almost any blue archetype with counterspells. It can kill a creature or even just cycle and let us use some unspent resources when opponents refuse to cast spells into our open counterspell mana. Grixis Control often can’t afford to play this as Kolaghan’s Command is just better, but Jeskai can and will use the help against Lingering Souls and the like. Electrolyze isn’t essential, and could be replaced with just about anything else, but I’ve been liking the extra help against Lingering Souls and a better Snapcaster Mage target than Lightning Bolt in blue matchups. I initially cut Clique due to card availability when I picked up this list, but after playing a few matches with Nahiri I knew I wanted it back. My opinion on Vendilion Clique has always been slightly cooler than the norm—I just haven’t found myself drawn to the card in control decks. Game 1 sees Clique eat removal that would otherwise be stranded and in true control decks I’ve found the temptation to devote resources to a tempo line ill-suited to my list a recipe for disaster. However, Vendilion Clique is excellent when our strategy forces our opponent to have narrow answers. In the Splinter Twin deck I mentioned at the beginning of the article, Vendilion Clique served as a tempo-threat, but also as a way to achieve information about the opponent’s hand and preemptively remove pieces of interaction that could disrupt its gameplan. This characteristic contributes to our Nahiri gameplan tremendously. On curve, we can counter a threat on turn two, and then end of turn three cast Vendilion Clique to remove a potential Dreadbore or Maelstrom Pulse ahead of our turn four Nahiri, the Harbinger. Vendilion Clique even provides a body to trade (or just chump) an attacker, giving us time to untap again and deploy removal or a sweeper to further protect our Nahiri ticking towards ultimate. While control players should hesitate to use Vendilion Clique as “training wheels” to figure out which spell to counter, etc., the information it provides is helpful there as well, along with just generally disrupting opposing strategies. Taking Tron’s only fatty in the nightmare scenarios where they achieve Tron can often be enough to secure victory, or buy us time to find our Crumble to Dust. I’m sold on Vendilion Clique, at least in this list. As for the sideboard, I’m currently using a basic package similar to what a bunch of other lists are employing. Most of the cards here are self-explanatory, so I’ll only speak on a few fine points. Engineered Explosives is rarely worth it. I’ve never found myself interested in casting this card, or at any point of the game wishing I had one to play, except perhaps against Infect or Merfolk. Against Infect we are more than fine, and against Merfolk we can just play another Anger of the Gods and it won’t change the matchup too much. I don’t mind the “catch-all” sideboard slot, but Engineered Explosives is not on Spellskite level for me. With the new rules changes dictating that a flipped Delver of Secrets has a CMC of one, not zero, I’m convinced Engineered Explosives should pull a Bieber, and disappear quickly and quietly. Celestial Purge is getting better. Lots better. It hits Blood Moon, it hits the red deck, it hits Liliana of the Veil, and it hits opposing Nahiri, the Harbinger. Celestial Purge is actually the best answer to Nahiri in Modern, as it is both cheap, instant-speed and Snapcaster-targetable. As if white needed its sideboard options to get any better. Geist of Saint Traft is interesting, but a little underwhelming in my opinion. It’s more of a mirror-breaker than anything at this point, and feels disjointed to our strategy when we’re boarding out Lightning Bolt and Lightning Helix. If we were a little more creature-focused and had Restoration Angel to get tricky I might feel stronger about this spell, but I haven’t found myself going to it often except in blue matchups. If that is the case we could look elsewhere, like to more counterspells. Though we already have a bunch, which makes me feel like we could use these slots for other matchups. Cards on the fringe that I’m looking to include in board: Rest in Peace, Wrath of God, Izzet Staticaster. Jeskai Control in Modern exists in equal parts thanks to two powerful planeswalkers: Nahiri, the Harbinger and Shaun McLaren. While the maindeck is relatively tight at this point (roughly 4-5 flex slots) the core can actually shift a bit based on the context of the format. More than anything this indicates the healthy state of Modern. When we can easily shift from instant-speed general answers to sorcery-speed bombs and our deck strategy remains the same, it shows that Modern is at a point where you truly can play anything. While I won’t go so far as to put Chandra, Flamecaller or Goblin Dark-Dwellers in my deck just yet, other players have and that type of experimentation always improves archetypes in the long run. If you’ve been playing with Jeskai, let me know in the comments below, or stop by my stream and say hello! I’m streaming about every weekday now (starting around 10 or noon EST), so I hope to see you there! UWR control had a long and developed history before Shaun McLaren won that pro tour. It’s had a LOOONG history in modern as a strong archetype. Nice article, Trevor. We’ve been needing a primer for this deck for some time. There are 2 cards that I wanted to ask you about, though, and those are Relic of Progenitus and Desolate Lighthouse. Rest in Peace is undisputably the more potent graveyard hate card and probably the better solution if the only graveyard-based matchup you fear is Dredge, but the Relic is cheap, it cantrips, and it can keep the likes of a Goyf in check while you flex your control muscles on the Lilianas and Bobs in the list while still keeping your Snapcasters live. Seems like a way to have your cake and eat it too. The Lighthouse also seems like an excellent mana dump, since it actually provides a superior form of looting than Nahiri’s +2, and can be activated at instant speed. I’m rather pessimistic about a lone Ghost Quarter’s ability to make a dent against manlands or Tron, so I think I’d rather have the Loothouse. What say you? One of the best things about Jeskai Nahiri is how customizable the shell is. For example, in my list ive tried to cut all of the ‘situational chaff/air’ in favor of a higher spell density. Ive found that I like the list with 1x Isochron Scepter, 4x Tectonic Edge, and 4x Lightning Helix way more than I like playing 3 mana sourceries or ancestral visions main deck. The real trick with this deck seems to be about identifying metagame trends and updating the list accordingly. i enjoyed this primer, MN brings good content like this when CF or SCG have mostly standard oriented articles that aren’t interesting and this is very interesting. Hi, I’m just now thinking about building a modern deck and since I’ve always liked playing UW and UWr in MWS those are what I’m looking for. Is the Nahiri version of Jeskai simply the best one right now? Are other lists that go without her completely obsolete or outdated? For example, a list that tickles my fancy is this one http://sales.starcitygames.com/deckdatabase/displaydeck.php?DeckID=54169 Is it downright worse than Nahiri variations? I really like the Cryptic Commands, plus other things on the list and it looks a lot more fun to play. Regarding my interests in UW control, a list like this for example: http://www.mtgtop8.com/event?e=11774&d=267147&f=MO looks very fun to play, maybe not so much as UWr but still fits the type of deck I like to play. The question is, is there any reason why I should not play this over UWr? I feel like UWr is more consistent in keeping the board clean early whereas UW has the 4 supreme verdict maindeck to ensure that by turn 4 you will probably be wiping anything out. Plus I feel like the UWr is more versatile in the ways it can win than UW which wins basically by Celestial Colonnades and Walkers while UWr can win by direct damage too on top of the manlands, plus that list I like runs Geist and Vendillions, which are also good clocks ,considering of course no one says “you shouldn’t play that list over Nahiri variations by any means” and we can build that in the first place. Anyway, anyone kind enough to help a fellow, less seasoned, mtg player? Hi I’m not sure if your still looking for opinions but here is what I believe and have seen while watching some of the current scg tournaments unfold. None of the lists are outdated or does any deck need Nahiri as the win con. I look at the new jeskai Nahiri deck and view it more as a tempo/control Deck. You attempt to keep the board relatively clean for Nahiri to come down and then I normally drop Cryptic to tap creature snap it back and then it’s gg. Then nice thing with the Nahiri variant is alot of people have been playing Geist in the SB and switching them out when a long game is not necessarily the easiest way to win. Control decks without Nahiri suffer from having all the answers in your deck but not the right one at the right time. This is where Nahiri eliviates this problem by discarding bad answers and attempting to find the right one. Control decks despite this are also not bad as they play playset of serums and Ancestral to beat opponents the best way I know how, pure card advantage. Let me know if my opinion helped or you believe to be totally off base. First of all, very good article, helped me a lot finishing my own list and gave me some confirmation that Verdict MD wasn’t insanity. Even though there are 2 copies of spreading seas you did not make any comments on it. Are they there to deal with manlands? Maybe some early interaction against Tron?